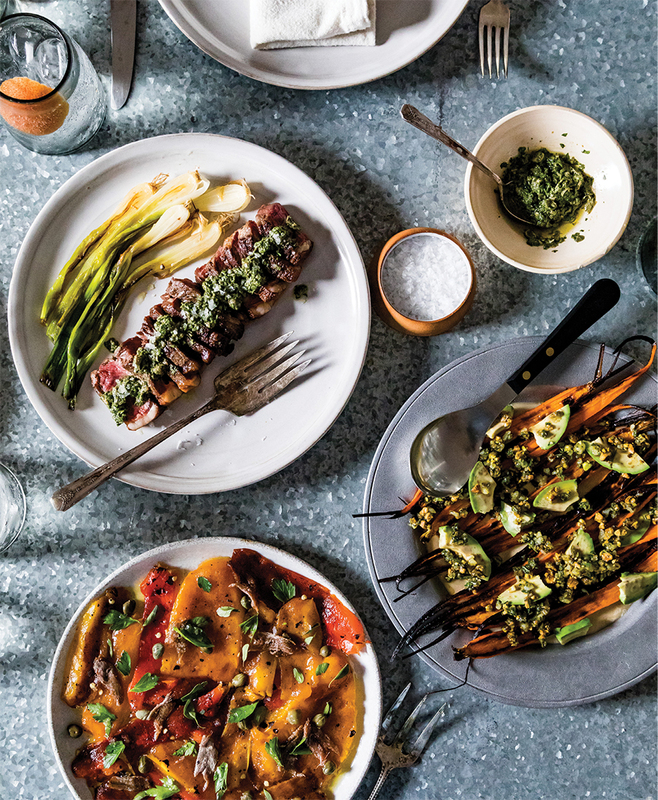 For a presentation that’s a little more rustic, Reitz mixes the herby green sauce by hand to serve with bison strip steaks (above), tears the charred peppers rather than chopping them (below), and roughly dices avocado to top roasted carrots. 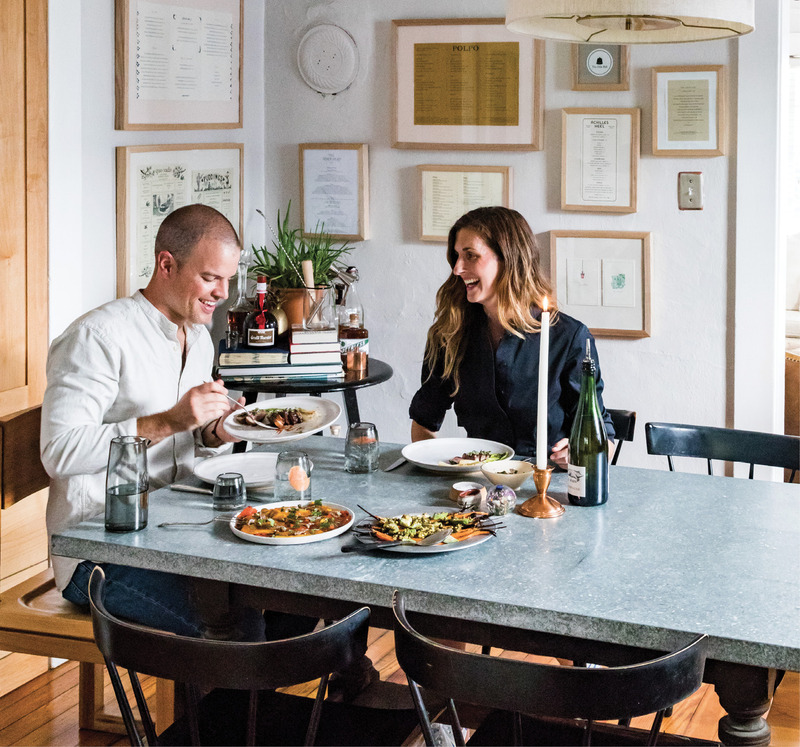 Restaurateur Brooks Reitz and his wife, Erin, prep a vibrant autumn meal in their North Central home. 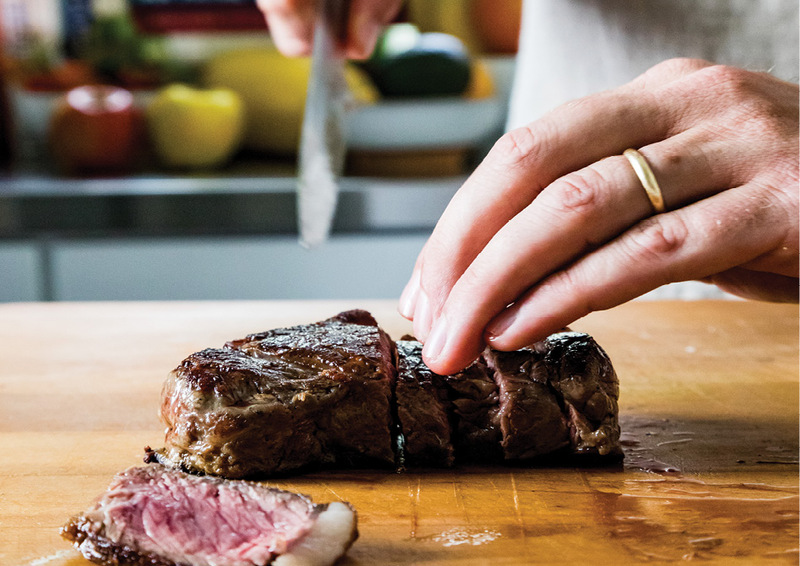 Grass-fed bison strip steaks can be purchased at WholeFoods Market. Erin mixes cocktails with 11/2 ounce Ethereal Gin, 1/2 ounce Jack Rudy Tonic Syrup, ice, grapefruit La Croix, and a grapefruit peel garnish. Cozy dinners at home are a welcome reprieve for the busy entrepreneurs. Plus, special touches like lit candles and beautifully garnished dishes make the case for spending date night in. 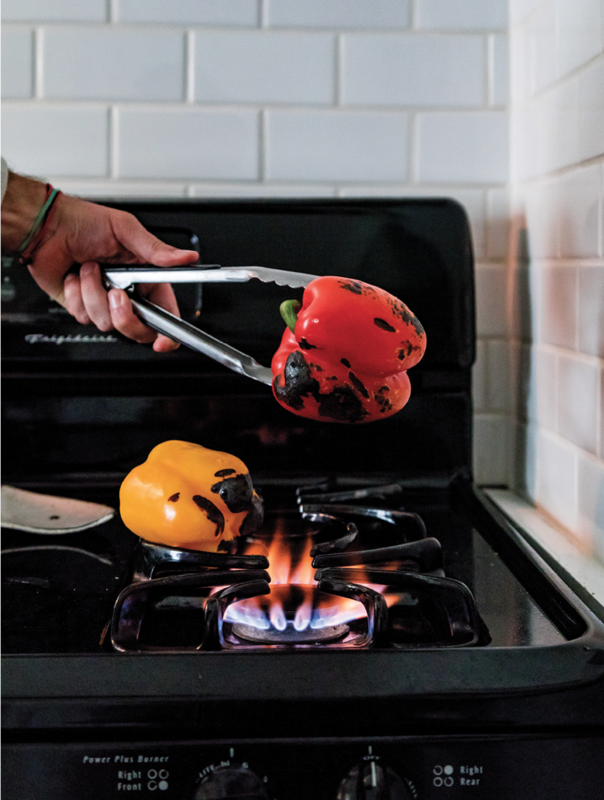 Reitz roasts peppers over an open flame, turning constantly, until they’re charred on all sides. 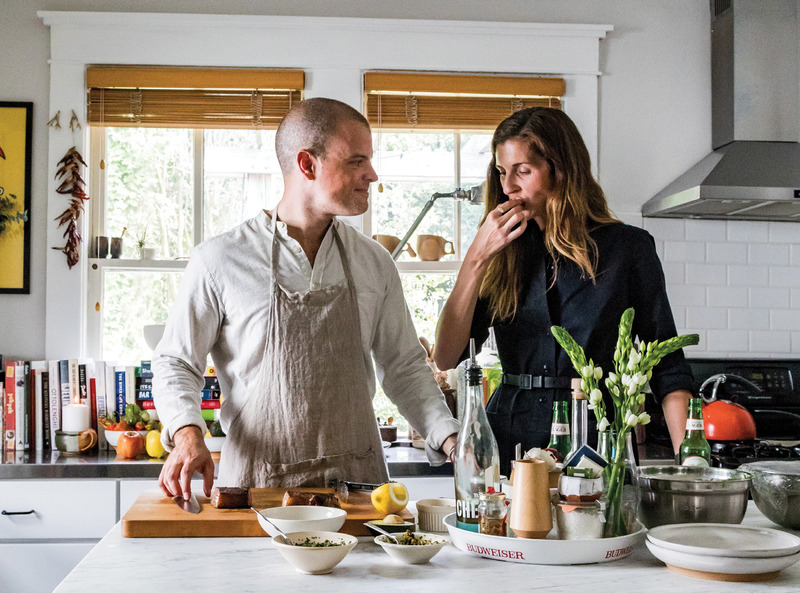 PHOTO: Restaurateur Brooks Reitz and his wife, Erin, prep a vibrant autumn meal in their North Central home. In some ways, the restaurant business and show biz are cut from the same cloth. Successful restaurateurs tell a story, transporting diners into choreographed worlds with every meal. And local entrepreneur Brooks Reitz, in tandem with business partner Tim Mink, found his groove with critically acclaimed hits like the New Orleans-style Leon’s Fine Poultry & Oyster Shop and the retro joint Little Jack’s Tavern. Though he set out to become a playwright, the Kentucky native found a different calling in school. “While studying English as an undergrad, I worked in a restaurant, and I realized that the food and beverage industry also had a theater-like quality,” recalls Reitz. From imagining décor to crafting a menu, developing a restaurant is like setting a stage. These days, the mastermind is finalizing his latest production, Melfi’s, a pizza place set to open at the end of the year. 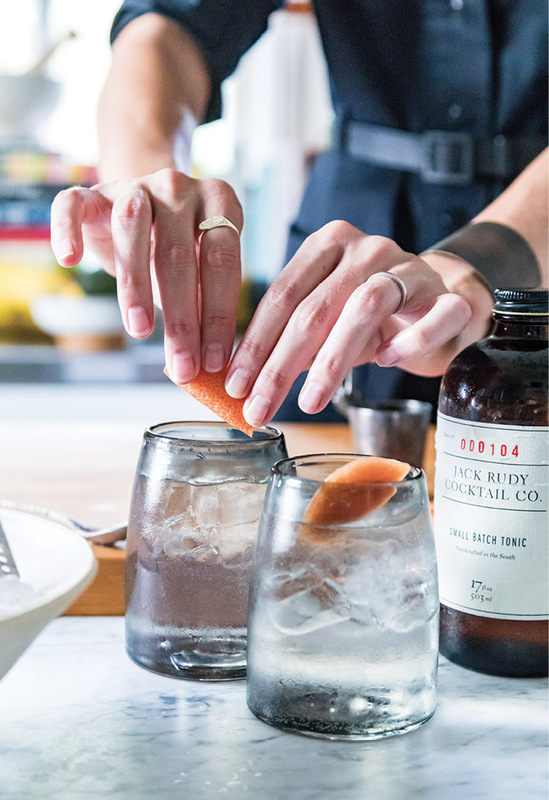 While Reitz pulls together the cozy autumn meal, gathering inspiration from dishes he’s seen on menus and in cookbooks, Erin tends to the vibe, dimming the house lights, arranging candles, and choosing music. As preparations are made, the pair sips tangy gin and tonics made fresh with grapefruit sparkling water and Reitz’s own Jack Rudy tonic, a product from his small-batch mix label Jack Rudy Cocktail Co.
For tonight’s presentation, a special date-night dinner celebrating the turning season, the couple veers from their plant-based norm: the star of the meal is bison strip steak, a cut for which Reitz gained an affinity while working in a Kentucky restaurant owned by bison farmers. “The steaks feel healthier to me than regular beef versions because they’re grass-fed and not quite as fatty,” he notes. Reitz tops the meat with roasted onions and a green sauce comprised of garlic, capers, and anchovies mixed with fresh herbs. 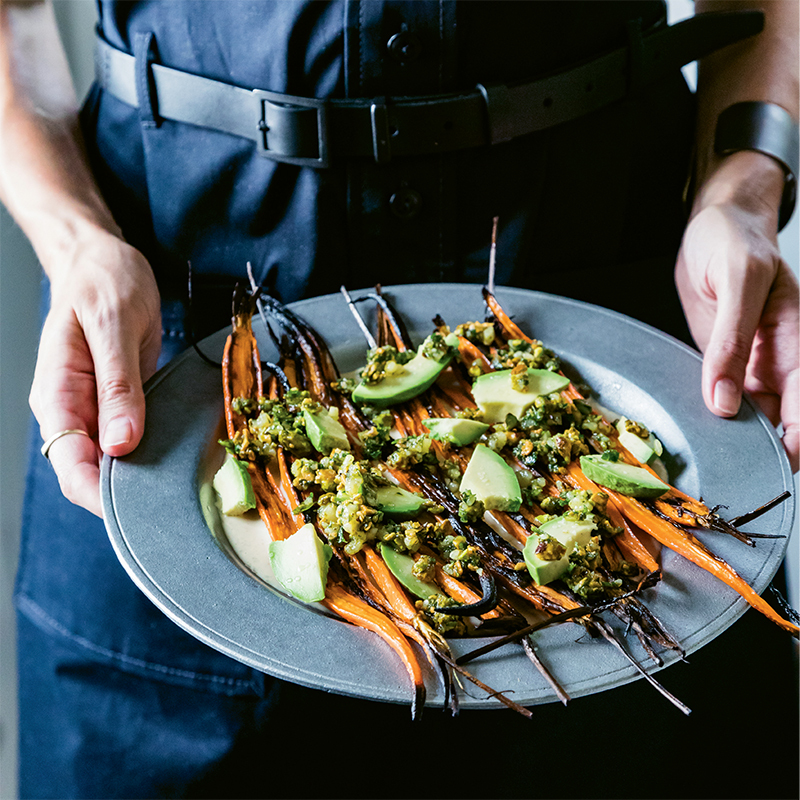 Alongside the steak, charred carrots sit atop a smear of creamy tahini sauce. The cook rounds out the dish with diced avocado and a homemade pesto-like dressing that blends together Parmesan, pistachios, and a Middle Eastern seasoning known as za’atar. The spread is complete with charred bell peppers plated with anchovies. “You want that quintessential flavor of anchovy, but with a cleaner taste,” says Brooks, who recommends high-quality fillets packed in olive oil, such as the Spanish brand Conservas Ortiz. For a final flair, he dresses the dish with petite marjoram leaves. Works: As the co-owner of Leon’s Fine Poultry & Oyster Shop, Little Jack’s Tavern, and soon-to-open Melfi’s, as well as the owner of Jack Rudy Cocktail Co.